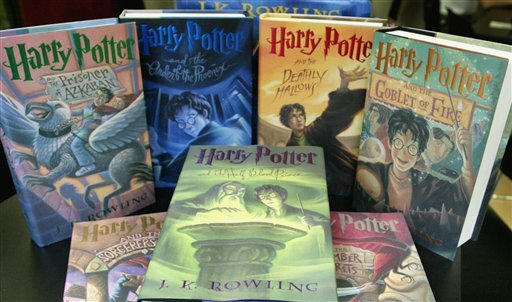 Amazon.com is offering Rowling's Harry Potter books in the Kindle Owners' Lending Library. The Kindle Owners' Lending Library now features over 145,000 books to borrow for free, including over 100 current and former New York Times Best Sellers. The Kindle Owners' Lending Library has an unusual and innovative feature that people love - unlimited supply of even the most popular titles. With traditional library lending, the library buys a certain number of e-book copies of a particular title. If all of those are checked out, you have to get on a waiting list. For popular titles like Harry Potter, the wait can sometimes be months. With the Kindle Owners' Lending Library, there are no due dates, you can borrow as frequently as once a month, and there are no limits on how many people can simultaneously borrow the same title - so you never have to wait in line for the book you want. Access to the Kindle Lending Library is through Amazon Prime and costs $79 a year. I am linking this webpage from my personal blog . this has all of the usefull information necessary.